The cantata opens with a chorale fantasia "with contrapuntal devices of awe-inspiring complexity". It adopts the motet technique of having the instrument and vocal lines follow each other closely. 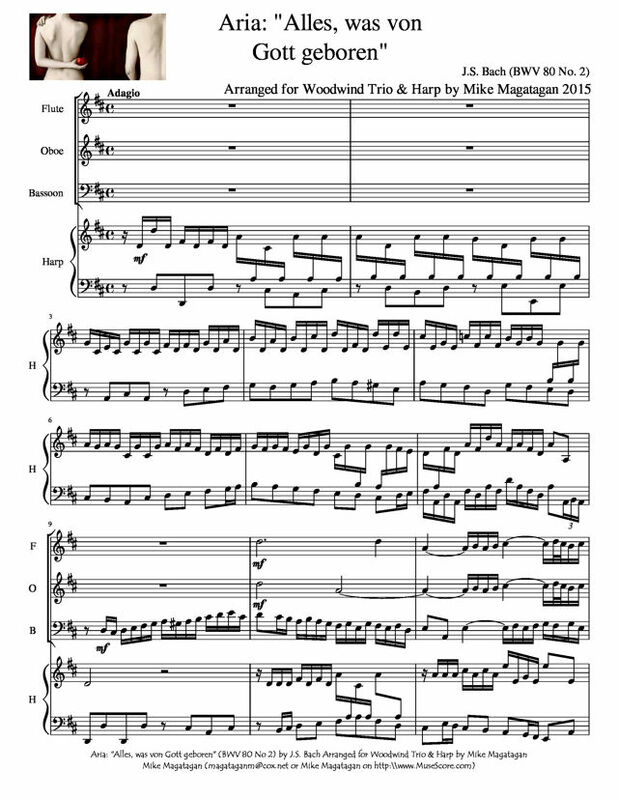 Structurally, the movement repeats the first two phrases, adds four new shorter phrases, then concludes with another iteration of the second phrase, all performed on oboe. All four voices "discuss each phrase imitatively as a prelude to its instrumental entry", using fugal devices. Craig Smith suggests that "in a genre in which Bach was the absolute master, this is probably the greatest motet chorus". 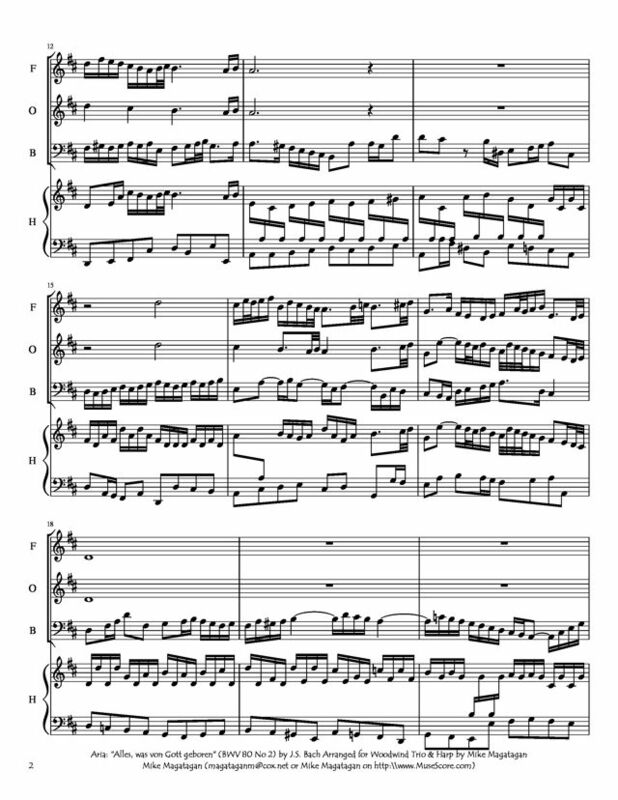 Wilhelm Friedemann Bach later added trumpet parts to this movement. In the second movement, the oboe and soprano perform an embellished version of the chorale while the bass sings an aria. The accompanying string ritornello is agitated and "relentless", in a form reminiscent of a concerto grosso. Simon Crouch compares it to a machine gun. Like the first movement, the duet is in D major and common time. The bass next sings a secco recitative and arioso, the only components of the cantata in a minor key. It adopts canonic imitation between the voice and continuo parts. 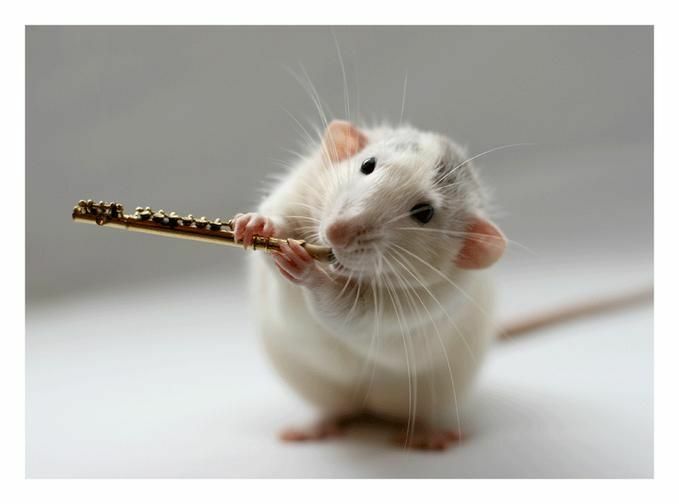 The fourth movement is a soprano aria with a continuo ritornello. It is characterized by extensive melismas and a "floating and ethereal" melody. The central chorale presents the chorale theme in unison voices, an unusual practice for Bach. The melody is unadorned and in 6/8 time. The orchestral accompaniment becomes more agitated and complex as the movement progresses. The tenor recitative is secco; like the earlier bass, it concludes with an arioso. The movement includes "occasional furious melismas". The alto and tenor duet is accompanied by continuo and obbligato violin with oboe da caccia. The movement is "submissive" in character with a texture that becomes more complex as the duet progresses, at one point including five simultaneous melodic lines. 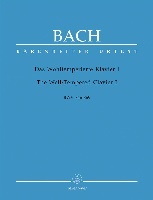 Bach uses a juxtaposition of "flowing, largely semi-quaver" instrumental parts with the vocal "crotchet/quaver rhythms" to depict the shield of the faithful. The final movement is a four-part setting of the chorale. 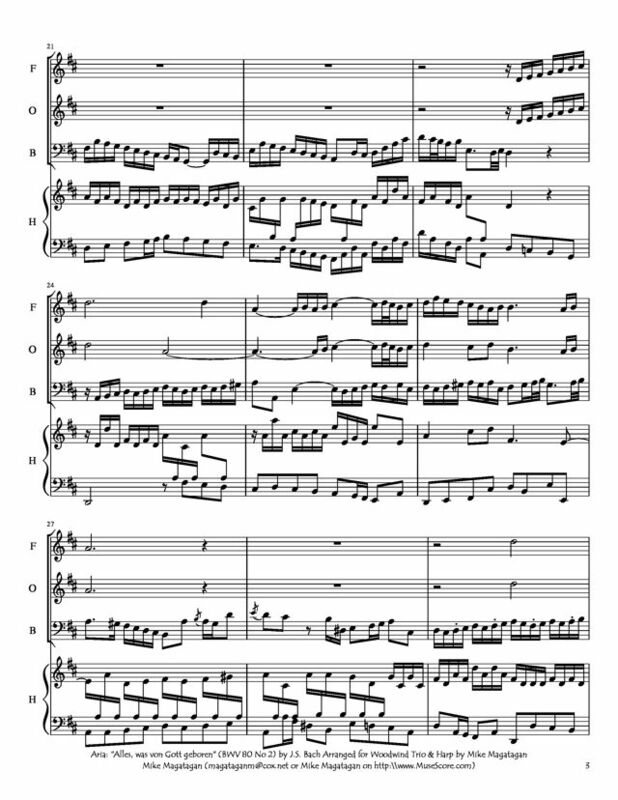 Although originally written for four vocal soloists (soprano, alto, tenor, and bass), a four-part choir, two oboes, two oboe d'amore, oboe da caccia, two violins, viola, violoncello and basso continuo, I created this arrangement for Woodwind Trio (Flute, Oboe & Bassoon) and Concert (Pedal) Harp.